On behalf of the dedicated and committed officers of your Nappanee Police Department, I welcome you to our website. We are hopeful that we will be better able to serve you by providing this resource for current information on our programs, staffing and department information. As we view ourselves as your police, we view you, each resident and visitor, as part of our community. With this in mind, our overall goal is to create a cooperative relationship between the police and residents to identify problems that impact the quality of life, to devise strategies to address those problems, and to work together to solve them. 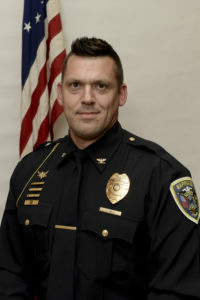 The members of the Nappanee Police Department will continue to remain committed to looking for new and innovative ways to keep the strong partnership with the citizens of our community as well as the local business. As guardians of the public trust, we will promote and achieve the highest quality of service for all citizens and businesses and foster an atmosphere where every police employee’s conduct, performance, and commitment is self-evident. As your Chief of Police, I am honored to serve this community. I deeply appreciate the support and confidence that has been extended to me by Mayor Jenkins, the municipal management team, and residents of this city. Thank you for visiting our website, we hope that you will frequent our site often for up and coming news and information that may be relevant to you.